Spring is here and it’s my favorite season of the year! I love when the days get longer, and warmer. It’s so exciting to be able to pack my thick winter clothes away and pull out my favorite spring clothes. Last year, the weather was pretty crazy and it felt almost like we went from really cold weather to hot all of a sudden. But this year, I hope we get to enjoy gradual change in weather and the beauty of spring. Since I’m usually at home wrapped in blankets during the winter, I like to get outside during spring. One of my favorite things to do is take walks in the evenings. We already know that exercise is an extremely important part of a healthy lifestyle, so I try to incorporate it into my daily life. During the winter, exercise is mostly walking on the treadmill or doing yoga in my room, but during spring, I like to go running at the local boardwalk. It’s a nice feeling to listen to some music and feel the cool breeze on my skin as I get in some daily steps. Another thing I look forward to in the spring is sitting outside to do normal things. I like to sit in my favorite chair in the backyard and just read, sketch, or write. Just things that I would normally do inside! I actually don’t like to do things outside during the summer because it’s just too hot and sticky, and there are wayyy too many mosquitos flying around. But spring is the perfect season–the weather is not too cold or too hot, and there aren’t as many bugs as there are in the summer. The last thing I can’t wait to do this spring is…drink lots of iced drinks! I love iced drinks, but the ones from Dunkin or Starbucks are just too sweet and over time, the price adds up. So last year, I watched some videos and learned how to make my own iced tea and iced coffee! Now they are a lot healthier and so much cheaper than if I were to buy them every time I felt like drinking them. I pretty much only drink hot drinks during winter, but as the weather starts to warm up, don’t be surprised if you see me sporting my homemade drinks as I walk to class. I recently bought mason jar-mugs like these so that my iced tea can look just like this. As you can probably tell from my post, I am just so excited and ready for spring this year. I hope the weather starts warming up soon so we can all enjoy some nice time before the hot weather comes again. Every semester, as I get swallowed up by studying and other responsibilities, I always forget about my hobbies (like drawing and writing). And then when I do finally get a break from work, I almost forget how to do them! I think this is a problem that a lot of college students, or just students in general, go through when they are overwhelmed with work. But this semester, I am making it my goal to hold onto my creative side. This year, I started a new sketchbook. It’s a Moleskine art book, and it is pretty small, so I keep it in my backpack. Since I always have it with me, I am able to pull it out when I am waiting between classes and doodle a little bit. I have already seen a change in my drawing habits, since in previous semesters, I would forget about drawing when I had spare time. Now, it has become somewhat normal for me to reach for the sketchbook when I have a little time. Another thing that I am doing this semester to boost my creativity, is decorating my planner. Last year, I tried keeping a bullet journal to organize my assignments and other tasks, but it was more stressful than helpful. I am a perfectionist, and trying to make every line perfect really just burned me out. This year, I have a planner with weeks already set up. It is plain though, so it allows me to be creative without making me get tired of it. So I have been stocking up on washi tape and stickers that I am using in my planner. It makes my planner look nice, and doesn’t really require me to spend a lot of energy and time in making it look good. In terms of writing, I often get writer’s block during the semester. I recently bought this little journal called, The Severed Moon, by one of my favorite authors, Leigh Bardugo. She put quotes from her books as well as other little prompts in the journal. The book itself is quite small, so there isn’t a lot of space to elaborate, but for me this is perfect and allows me to focus for a period of time. These prompts are fun and make you think, and they are great for people who like to have a guide to keep their creativity flowing. I think for most hobbies, it is hard to keep up with them during school season. But most of the time, there is a way to include your hobbies in your daily life. I hope my tips can be helpful for anyone who wants to include more drawing/writing in their day. A little creativity can really boost your mood and give your brain a break from the routine! November is almost over and we all know what that means…FINALS 😦 Finals and the weeks leading up to them can be super stressful for most of us, so I thought I would compile a list of some ways to make it a little more bearable! This one may seem really obvious, but it’s really easy to push things off until the last minute. I think the most helpful thing you can do for yourself is to create a list of ALL the assignments and important due dates you have coming up. I recently made one of these for myself, and though it was a little stressful seeing all of those assignments to complete, I felt so much better knowing that I (sort of) have everything under control. Plus, it’s so satisfying to cross things off of my list as I finish them. I may have mentioned Forest in a post a while back, but this app is responsible for 90% of my productivity. Once you set the timer on your phone, you can’t use it until the time is up (otherwise you will kill the tree). I think this was a paid app (maybe $2?) but I’ve been using this for over a year now, and it has definitely been worth it. It’s is the perfect way to make sure that you can’t get distracted by your phone. I also recently discovered that there is a free forest chrome extension that allows you to choose websites to blacklist. I use this to block YouTube and Netflix while I am in the middle of a study session, but this might be also helpful for anyone who wants to use it to block social media! Everyone is different, and some people like to study with music while others don’t. For me, it depends on how much concentration I need to do. So I have a bunch of playlists (really, I have too many), and I choose what I want to work to based on my mood. For example, I have one with soundtracks like Pirates of the Caribbean and Game of Thrones, and I have another playlist with classical music for when I want to feel calmer. I also find lofi hip-hop playlists on YouTube pretty relaxing to listen to. Music can help you feel better when you are feeling down! 4. Include breaks in your schedule–and make sure you take them! I used to have this really bad habit of setting aside break times, only to end up ignoring them and continue studying. But I learned the hard way that this only makes you feel more tired and burnt out from work later on. Sometimes I read, sketch or do a little bit of yoga during a break–just anything that allows me to step away from the work for a few minutes. Although you may feel like you don’t need a break, your brain will thank you! One of my favorite things to do in October (other than eating apple cider donuts and going pumpkin picking) is reading scary books! I don’t do well with horror movies, so I turn to books to get my scare fill. This month, I read Hunting Prince Dracula by Kerri Maniscalco, and I think it was the PERFECT autumn read! Hunting Prince Dracula is the second book in the Stalking Jack the Ripper series by Kerri Maniscalco (BTW: I will not be spoiling either book in this review, but you definitely should read the first book before picking up this one). Following the events of the first book, the main characters, Audrey and Thomas are both traveling from London to Romania to attend a forensic academy at Bran Castle for four weeks. There they will undergo an assessment to possibly secure a permanent spot in the academy. In the first book, Audrey and Thomas were both working on the case of Jack the Ripper, and in this book, they are investigating the mysterious appearances of bodies drained of blood and/or staked through the heart. This book is pretty fast paced. From the first chapter, we jump into the mystery and action, and it doesn’t slow down. As the story progresses, we pick up different clues, so that we can formulate our own opinions on who is responsible for the crimes, and what is going on in the academy. I also appreciate the romance sub-plot, as it adds to the story without taking the focus away from the mystery at hand. The plot is exciting, but my favorite part of this book has to be the characters. Audrey and Thomas are two of the best YA characters I have ever read about. Audrey is intelligent and curious (sometimes too much for her own good), and she does not let anyone try to take control of her life. She is headstrong and funny, and it’s refreshing to read the book through her keen eyes. Thomas is the other main character, and he also happens to be the love interest in this series. I could talk about his character for hours, but I will try to keep my gushing to a minimum 🙂 Thomas is probably the funniest character I have ever read. He is hilarious and provides a perfect dose of humor into the dark mystery of the rest of the book. Like Audrey, he is also very smart and picks out clues from pretty much anything around him. And like any well-fleshed out character, Thomas has his own set of flaws, which we see him try his best to address. To me, a book can have the most exciting plot, but if the characters don’t feel realistic, then I just can’t lose myself in it. And I personally think that Hunting Prince Dracula has the perfect blend of plot + characters. So if you are looking for some good books to read this season, I definitely suggest picking up Stalking Jack the Ripper and then Hunting Prince Dracula. The first book in the series is also an immersive, dark mystery, that I think will appeal to a lot of readers no matter what genre you favor! If I could give any new student advice, it would be to not be afraid to try new classes in college. I learned this the hard way. You never know what you’re good at until you try it yourself! I went to a biology/research oriented high school. And after four years of being surrounded by life sciences, I felt like that was what I was good at and what I should continue studying in college. To be honest, I never really had a passion for biology. I liked it because I got good grades, but I wasn’t excited about it. When I first came to Rutgers and we had to choose the classes we would be taking, I wanted to jump right into classes for a biology major. I was afraid to try new classes, mostly because I am a person who likes familiarity. Classes like chemistry and biology were familiar and felt safe to me. So for my first year of college, I persuaded myself that Cell Biology and Neuroscience was the major for me and the one I would be most successful with. But during my second semester, I realized that I wasn’t happy. I didn’t look forward to any of my classes, and I kept questioning why I chose to be a bio major. So I talked to my dean and I decided that the next semester (the first one of sophomore year), I would take a mix of classes and just try them out. And by trying a mix of classes, I learned that psychology is where my passion lies. One of the classes I took that semester was Cognition, and it is probably the best class I have ever taken at Rutgers. It was so interesting, and I was just so excited to go to every class. I attended the office hour discussions to learn more about the subject, and I even went to some of the events that were related to the class. I had never felt so excited about a class, and I honestly didn’t know it was possible to like a subject that much. That’s when I realized that I would be a lot more successful (and happier) if I continued studied psychology. I do feel like my first year was a bit of a waste, and I wish that I was more open-minded and let myself try new classes during my first year of college. But it’s too late for those regrets. I am just thankful that I was able to find a subject that I really enjoy and look forward to learning. Anyways, I feel like I am rambling a bit, but the point that I am trying to make is that it is good to try new things. You will never know what you are good at or what is calling out to you until you explore what Rutgers has to offer. I have heard countless times from deans and professors that most students change their majors at least once. And I totally understand why. College is so different from high school. Not only do you change, but your interests might too, and you will never be sure what you are passionate about until you try it yourself! So don’t be afraid to try new things! By the time this post is up, the release of Avengers’s Infinity War will be only a day away! In this movie, Thor lost his hammer, his hair, and his eye. These were all physical things that he thought made him the powerful person he is (well, the eye is an extreme example, but you get the idea). He thought that without his hammer, he would have less strength and be less capable of doing what he was able to do with it. He initially felt lost without his hammer, as if a part of his identity was gone with it. At some point in the movie, while Thor is doubting his abilities sans hammer, Odin asks him “Are you the god of hammers?” It was at that moment that he really realized that the hammer is just an object. It does not solely give him strength or unique abilities, as he has power within him. And he is able to do incredible things even without the hammer! This is what raw power looks like. We all go through rough patches in life. Sometimes we are put in situations where we feel like we are disadvantaged or as if we are deprived, and are consequentially farther from reaching our goals. It is normal to feel less capable when we do not have the same resources as someone else has. But inside, we have the power to shape who we want to be. When we are placed into a tough situation, instead of dwelling on the negative aspects and on what is keeping us from moving forward, we should instead look at the positives. We all have the power to change a situation from bad to good, and half of that battle is our attitude toward the problem. I think that this is important to remember as we approach finals well. I have noticed a lot of negativity swirling around in my classes (and I regret to admit that I also contribute to that cloud of sadness). We should all keep in mind that no matter lost we may feel, how many assignments may be piling up, or how many tests may be approaching, we do have some level of control over our outcomes. Instead of focusing our energy on negative things like how many days we have left before exams, or how many more topics we have to cover, its more worthwhile to find ways to boost our self-esteem and get things done. I realize that this is a stretch from the Thor lesson, but I believe that we all have strength within us. Negativity is like Thor’s hammer in the sense that it keeps us from recognizing our true potential. I feel like my thoughts were a little disorganized, but I really do think that Thor taught us a great lesson about taking advantage of our inner power! Something that I have noticed about myself is that it is really hard for me to be productive if I don’t have the pressure of an exam or a deadline to push me to get work done in advance. I’ve procrastinated more than usual on important assignments recently because I just could not get into the “study mode.” If I am not in the “mode,” I either take a much longer time to get work done, or I don’t fully understand what I am working on. And that is just a huge waste of time! So I made a list of some of the things that I do to help myself get into that study zone and be more productive during a study session! Hunger is my biggest distraction while I am studying. There is nothing worse than getting in the “study zone” only to feel hungry and realize that I didn’t bring any snacks with me. And that has actually happened to me multiple times. So now, I make sure to bring granola bars or fruits with me when I study. I personally like nuts, grapes, blueberries, or other small snacks that I can continually pop into my mouth whenever I feel the hunger. I also make sure to always have water with me, or if I am at home, I make a cup of tea! Study music is the second most important thing for me when it comes to creating a perfect study atmosphere. It depends on how I feel that day, but I usually either listen to movie instrumentals or white noise. I don’t want the music to distract me, but at the same time, I get distracted when it is too quiet. My favorite instrumental soundtracks include Game of Thrones, Pirates of the Caribbean, and Guardians of the Galaxy. Such music tends to keep me awake and helps me focus. If I don’t feel like listening to actual music, I play Harry Potter or Lord of the Rings ASMR on YouTube. It may sound self-explanatory to prepare all of your tools before you study, but you would be surprised at how many times I have forgotten something essential. I like to take elaborate notes, so I always have to make sure that I have my highlighters, colored pens, post-its, and white out with me, otherwise, I can’t take my notes the way I want to take them. It may sound unnecessary, but sometimes, taking the time to make pretty notes helps you to study more effectively. I have found that when I make my notes colorful, I am able to better remember the information later on, and it is more fun to study those notes before the exam! I have recently started using an apple scented candle while I study, and it really does make a difference! The smell instantly makes me feel good and takes away some of the stress that is usually accompanied with a study session. I recently read this article about how smells can help enhance memory recall, and I think its an interesting concept that I would like to try! These are some of the essentials that I have noticed make a huge difference when I am trying to create a productive study environment. I hope they can help anyone who has trouble getting into or staying in the study zone! Self-deprecation is something that affects everyone, some more than most. For me, it is still something that I am battling today. But I have realized recently, that in order to improve my self-image and become the person that I truly want to be, I have to be aware of the bad habits that I engage in that lead to the lower image that I have of myself. I am going to identify two of these habits and address ways that I over come them. And hopefully, I might be able to help some of you who suffer from low self-esteem too. 1. Do you compare yourself to other people? One of the biggest problems that I face, is that I compare myself with my classmates. I look at other students and wish that I could be as smart, as social, or as productive as they are. These thoughts only make me feel inadequate. They don’t help me become a better person; they only bring me down. Now, whenever I find myself comparing my capabilities to other people, instead of thinking about how much I don’t like about myself, I think about how much I do like. For example, I think about how I am proud of the amount of work that I have done for the class, and I remind myself that I put in as much effort as I can. Those small reminders really help me feel more confident in myself, so try it the next time you feel like you are not as good as your peers! 2. Do you ever feel like you are not living up to your own expectations? We all set high expectations for ourselves. We want the best grades, while also being able to balance extracurriculars, maintain our health/fitness goals, and build strong social relationships. Realistically, it is not fair to hold ourselves to such high standards and expect to attain all of them, because if we fail to achieve everything we want, it can lead to feelings of inadequacy. Instead, we should reevaluate our expectations of ourselves. For example, I make goals in my journal that I hope to achieve in the month. They are not crazy goals like “get an A on every exam” or “work out every day”. Those are extreme goals that I know I cannot meet. Instead, I make reasonable goals like “work out at least twice a week” and “start preparing at least two weeks in advance for each exam”. Those may not seem like very specific goals, or it may not seem like I am pushing myself enough, but honestly goals like these have been working for me. They remind me of what I want to accomplish, while actually being within my range of abilities. And when I am able to accomplish these goals, it feels really good and motivating! I know how hard it is to stop comparing yourself to others, because I used to do it all of the time. But it only does more harm then good. I am overcoming these self-deprecating habits and you can too! Stop wishing you were someone else, and instead learn to love the person that you are. Recognize your strong points and use them to your advantage. I have given you two tips that have greatly helped me, so now I challenge you…to become the best and most confident version of yourself! It’s 2018, and although some of us are sick of hearing it, many of us believe in a “New Year, New Me”. We all have goals to achieve or things that we want to change in our lives, and the new year is the perfect time to be inspired to do something different. But most of the time, we have a surge of inspiration at the beginning of the year, and then that quickly dies down and we fall into the same habits that we had the previous year. I am personally tired of watching my years go by without making changes in my life, so I am trying a new method to achieving my goals this year. This year, one of my goals is to consistently bullet journal. Last year, when I started bullet journaling, I made too much of an effort to make it fancy, and I quickly grew exhausted and dreaded making spreads. So this year, I am going with simple but colorful spreads that do not require too much effort, and get the job done. Bullet journaling helps me keep track of what I do each day, and helps me make sure that I am keeping on top of my goals. One of the tools that I use to keep track of what I do each day is a habit tracker. 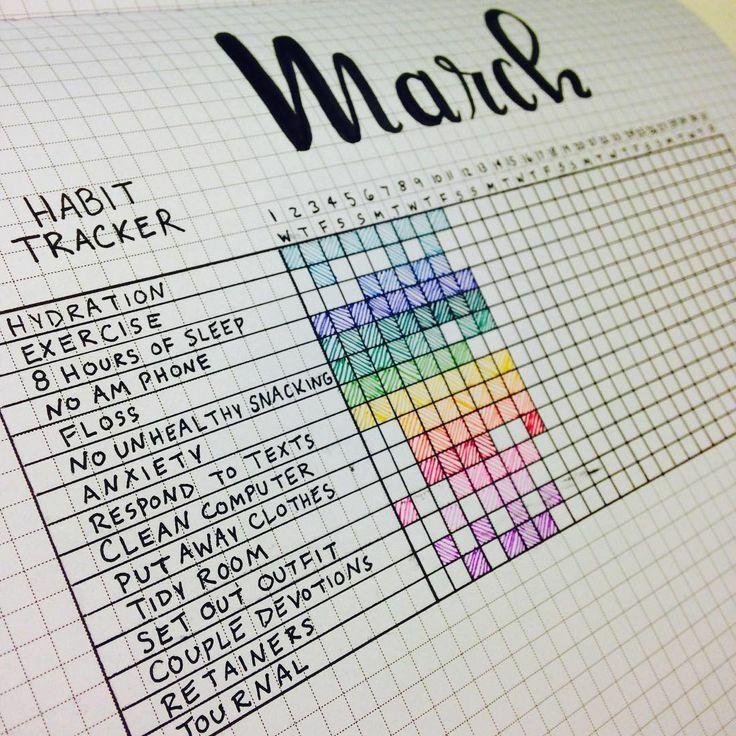 Here is a gorgeous example of a habit tracker! This is an example of someone else’s tracker that I used as a reference for my own. In my January habit tracker, I have activities like: exercise, drink green tea, read, draw/color, and Bible reading. Each night, I reflect on my day, and color in the little box that corresponds to what activity I did that day. Of course, each day I do not accomplish every goal/activity, so there are some gaps in my spread, but nobody’s perfect! Making a habit tracker, whether in a journal, or on a loose-leaf sheet of paper, is helpful, because it helps me to keep in mind what my resolutions are, and then I don’t forget about them. Another way that I am keeping track of my goals, is by using my phone/laptop reminders. I am one of those people who cannot survive without reminders. I use reminders for due dates, for events, for homework, anything and everything you can think of! I have also started using my reminders to help me with daily activities. For example, I have a reminder that pops up every day and tells me to take my vitamins (I always forget about them!). You can also set a reminder in the night to tell you to floss, or you can set one in the morning to remind you to do yoga before you officially start your day. These are really helpful, because although it is possible to forget about a journal, our phones are constantly with us. So why not use them in a way that will help us achieve our goals! This year, we can all be successful in achieving goals. Don’t be discouraged if you feel like you can’t keep on top of every goal. Even keeping up with one resolution will make a change in your life, and that’s a huge accomplishment! 1. Bring your laptop charger. During days when you are on campus for a long time, your laptop battery will drain. It goes especially fast if you are using it to watch Netflix during a break or listening to music on it. There were so many days that I forgot my charger, and I had to use the computer labs because I had to save my laptop batter for my evening class. There are actually a lot of charging spots all around buildings and at the libraries, so you will mostly likely always find an outlet to use. 2. Use the computer labs. I used to only use the computer labs when I had to save my laptop battery, but I found that you can be really productive there. When I work at the computer labs, I am surrounded by people who are also doing work, and it helps me concentrate. I don’t feel tempted to go on Netflix or Buzzfeed, and I just finish my work instead. Also there are usually printers so you can print out study materials that you might need. 3. Bring enough snacks with you. The biggest reason for my distraction is hunger. I get hungry really quickly, especially when I am doing work. So I always keep snacks that aren’t messy and keep me full. Some of my favorite snacks that I keep with me are grapes, Belvita bars, mixed nuts, and granola bars. If you don’t have enough time to grab food between classes, snacks can be very helpful! 4. Get study buddies in every class. Things happen all the time. Whether it be illness, traffic, or something else, it is always helpful to have someone in class who you can talk to about homework or exchange notes with. I try to make at least one friend in each class, that way if I need to get the notes from someone, I have their contact information. I have also set up study meetings with those same people before exams, and they have always been very helpful. Many people in your classes are also looking for a study buddy, so it should be easy to find one! 5. Make time to meet up with your friends. This I think is the most important tip for any commuter student. When I lived at school, it was so easy to meet up with friends for lunch or study with them because they all lived nearby, or just a bus ride away. Now that I don’t live at school, it is harder for me to meet with them. Sometimes it requires me staying at school later, but in the end, it is worth it to make time for my friends. Whether we are studying or just hanging out, I always feel recharged and happy after spending time with people who make me laugh! The experience of being a commuter student is different for each person depending on the length of their commute and the way their schedule is set. In the end, it does help you to learn how to be more productive during breaks between classes, and does force you to plan your days more so that you make the time to spend with friends or working. I learned a lot from my first semester as a commuter student, and am excited to see what it will be like next semester.